Flypower bursted into the badminton scene a couple of years ago touted as the brand that former Indonesian world champion Heryanto Arbi started. In a very short time Flypower has signed sponsorship with number one Indonesian pair Markis Kido and Hendra Setiawan as well as the whole Djarum badminton club of badminton players. Needless to say that I have been very curious with the quick rise in popularity of the Flypower brand. Flypower USA shortly signed with Flypower to be the main distributor and have provided BadmintonCentral with a few test rackets. 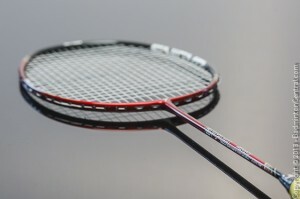 The Warriors 7 is the 2nd Flypower racket i have tested. 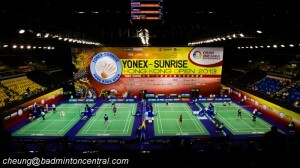 The Warriors series is Flypower’s head light series and was the series that Hendra Setawan used. Being the control player of the Olympics gold pairing we will expect the Warriors 7 to be super fast. And it is. Firstly, let’s look at the aesthetics of the racket itself. The Warriors 7 has a gray/red/black color scheme which is very striking and professional look. Again I am as impressed with the graphics design as the Tornado 900. Very professionally done which means anyone who look at it knows that it is done properly and looks expensive instead of some cheap imitation. Closer inspection reveals yet again full woven construction in both the frame and the shaft. Flypower isn’t afraid to show off the beautiful woven carbon fiber which is right now very popular and all the woven rackets i have tried all provide excellent feel and responsiveness. Beautiful as the woven CF maybe, I question Flypower’s choice to expose the woven CF at the t-joint. By necessity the wrapping of the fiber there is uneven and do not show up as nicely as on other locations. At the end of the day though it is just aesthetic and make no difference to the performance of the racket itself. Finally, add to that a couple of gold accent completes the overall design of the racket. Gray/silver occupying the top of the racket as well as the cone area, plus red accent in 3/9 o’clock position and the rest are exposed woven CF give the color scheme a very good color balance. My sample racket weighed an 87.25 grams with a BP of 292mm. Which is slightly heavier but head lighter than the advertised 85g and 295mm BP. The frame shape is mid-isometric with a slightly round profile. The head is quite slim at around 10mm +/- 0.2mm throughout the head. A 76 holes pattern with 3 pairs of non-shared holes at the 1/11 o’clock positions which is very standard and any stringer worth their salt will have no problem stringing it. In particular the 11th main strings at the sides hugs the 3/9 o’clock of the frame quite snugly. The extra support there means that pre-mature string breakage at those positions will be minimized. The shaft is slightly tapered with thickness of 7.3mm on the ends to 7.05mm in the middle of the shaft. As result of the thinner shaft, it feels medium stiff leaning towards medium. It holds up well with a fairly high tension of 28.5lbs laced with Victor VS850 string on my electronic WASE stringing machine. The racket hold it place pretty solidly and only gave in slightly with the 6 point support. With the relatively slim frame though I will be a bit uneasy to string it beyond the recommended tension of 30lbs. Perhaps it will be ok with a new racket but not after it has been used and abused in a doubles game. Grommet are again high quality with size matching on different locations. Shared grommets are flared appropriately to aid routing and protection of the frame itself. I had no problem threading the 0.67mm VS850 string through them though i would appreciate top non-shared grommets be offset to aid routing, they are not. 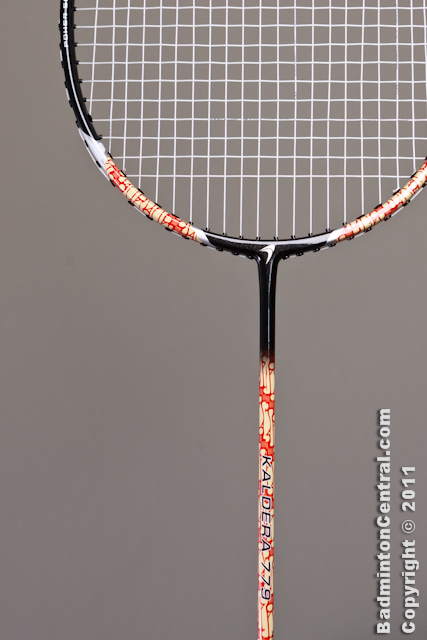 Similar with most the other rackets employing full woven carbon fiber, the Warriors 7 is a VERY lively racket. The impact with the shuttlecock is very crisp and solid, without much dampening felt at all. But not to confused that with excessive vibration, it is not. It is just the right amount of snap and the shuttle just bounces off. I really like the generous amount of feel, feedback and lack of dampening. Even though measured BP is 292mm the racket overall feels head light, which means it is incredibly fast for drives shots and super fast at mid/front court interceptions. This is really the soul of the racket, a head light racket that is fast and solid makes it an excellent doubles racket for those who like to drives and defenses very well. Drives are easy to execute. The repulsion provided by the slim shaft pushes the shuttle back as fast as it came. Furthermore, it does it with a crispiness that is rare to find even among the best of rackets in the market. Smash defense merely require a snap of the finger and wrist which was a joy to perform. I think this racket will be good to compensate for people are lacking in defense speed. I played a few mixed doubles games with it and find that the mid-court delicate touch and push shots are excellent. While i felt it is adequate, it would’ve been better if the racket provide a bit more stability. Net shots are surprisingly good with ample feedback and feel. Manuverability means that i also have no problem doing tricky cross court net shot with it. Clear and drops are simply just a relax snap of the wrist, and the shuttle just goes of with crispness. However, being a head-light racket i find it hard to do full out smashing with. The lack of head-heaviness means that smash technique needs to be adjusted. The Warriors 7 favor fast wrist smash instead of full out hard smash. When one figures out the intricacy of the balance, it is possible to do fast smashes but not particular heavy ones. It favors the mid-court interception type smash instead of the back court full power jumpsmash. Speed instead of strength. This is really a style difference as i know many people who attack better with light-headed rackets instead of heavy-headed ones. Unfortunately I personally prefer heavy-headed ones. Overall, the Flypower Warriors 7 is with no doubt one of the best head-light racket that i have tried. I have enjoyed using it for doubles drives and mid-court attack game both in regular doubles as well as mixed doubles. A lively racket with excellent feel and crisp impact contribute greatly to that. The only drawback being slightly weaker in smashes.